Stefan Lindegaard is working on his new book on Open Innovation. He has his first chapter available for download to get a taste of his thinking on the subject. I love his views and the initial read definitely presents a real world view on this topic of open innovation and crowdsourcing. There is however one key concern; I think we forget about the services companies and their role in open innovation. R&D is not seen in the same light as P&G for example, and there are many different challenges on delivering service innovations. 1. Organizational Orientation (inside-out) – using the capabilities and key strengths of the business to figure out what to make next and sell to customers (or “clients” as for professional firms). 2. Customer Orientation (outside-in) – using customers to shape what needs to be focused on next and then shaping some key delivery capability to achieve the stated intent. 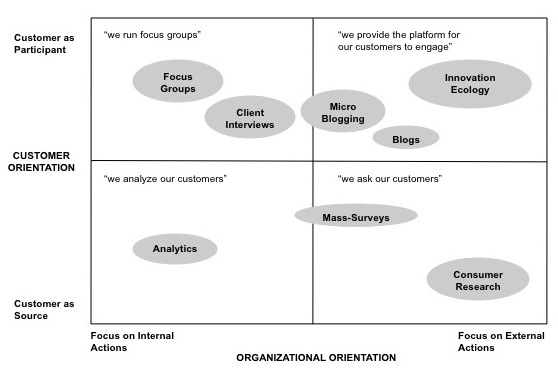 Organizational orientation is when a business relies on its analytical capabilities to drive new innovation campaigns. Furthermore it focuses on obtaining information from customers through deliberate actions and crafted surveys and research activities. Customer orientation is determined based on the primary actions of “listening to customers” and then to include the customer as a co-producer of value creation. The act of listening has limited value as we can’t really learn a lot from absorbing information from our customers only. We need to immerse ourselves in co-produced activity where the inventor lives with the recipient; understanding the way in which the invention will be used and value derived. The act of immersion will prepare you to drive innovation that focuses on “surprise”. As humans we want to be surprised with great products and services, we don’t want to be asked all the time. The Open Innovation Orientation Model is used to shape your involvement in a portfolio of activities to drive innovation activity. All actions are driven towards creating an innovation ecology where an organization can benefit from both the ability to engage the customer meaningfully and the ability to externalize some of the key capabilities to co-produce innovative outcomes. “Apple never holds focus groups. It doesn’t ask people what they want; it tells them what they’re going to want next.” wrote Stephen Fry in Time Magazine. If Apple can re-invent itself from the inside-out, what does it mean for Open Innovation? What does “open” really mean?